Here we are to present and review "Dedicated to the Flesh", the outstanding new album of Swedish death metal undead addicts Facebreaker! Without any doubt one of the best death metal albums for 2013 and a great step forwards for these Zombified meat-freaks! This album kills, slays, maims, will drive you totally insane and you can't stop listening to it! Their sound is always getting better and better on each new record, this time combining at best the most putrefied European/Swedish death metal essence with the most rotten U.S. death metal sound, all these with the add of some dynamic death n' roll groove. Imagine a catacomb pit infested with the most rotten sound of bands like Grave, Dismember, Bolt-Thrower, Six Feet Under or Obituary! An absolute deranged death metal art at it's true best! Be sure to get your hands into this Facebreaker death-cult album and inhale one of the most rotten pieces to come out from Swedish death metal crypts!! Get ready to be mutilated by a swarm of Zombies; they hunger for your tender human flesh! 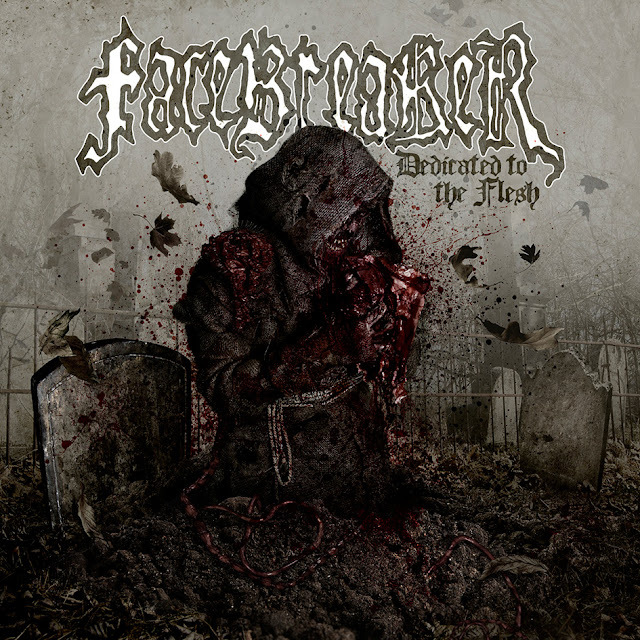 Dedicated to the flesh(...)" FACEBREAKER - "Dedicated to the Flesh"
For all those not familiar with Facebreaker yet, I must say that they are some of the most brutal and straight forwards Swedish death metal bands around, formed in 1999 by Janne, Roberth Karlsson ( Scar Symmetry, Aktiv Dödshjälp, Zombified and Tormented,etc), Mikael and Jonas who combined forces to create this band and with it forge the sound they liked at best! The band played already in great festivals like With Full Force Open Air, Party San Open Air, Death Feast or Legacy Fest, etc. where they got the chance to play for more than 10.000 people! A dead, rotten and hungry band that captured death metal fans ears since their debut "Bloodred Hell" (2004) achieving great reviews from the most respected magazines! The fourth album "Dedicated to the flesh" is another great step forwards on these Zombified Meat-freaks career. Straight forwards death metal, as putrefied as the old-school Swedish/European death metal and as rotten as the cryptic U.S. death metal. Imagine yourself in a Zombie infested catacomb pit with the sound of anthems from bands like Grave, Bolt-Thrower, Dismember, Six Feet Under or Obituary! Hahaa... better to get your sharp hatchet and start chopping some living-dead meat! Yet you couldn't get a better soundtrack for such Walking Dead massacre! Compared with the previous release "Infected", the sound has been developed into an absolute outstanding new level, concerning the lyrics by Janne Ivarsson(Guitars), all I can say is that they are at best, exploring this Horror Movie atmosphere to it's absolute maximum, taking you into outbreak undead infested lands where there is no way out... unless you unleash madness and start Killin' your way to live! "Dedicated to the Flesh" is a pure Zombie Holocaust in form of Death Metal art! One of the best pieces of the genre since some good pack of time! Death Metal reborn in the most demonically possessed form! The adepts wouldn't be disappointed, same to all those who are deep into horror, zombie movies... they will find here the best original (rotten) sound track to listen to! These living-dead carnage sound is a true trademark of Facebreaker, the demonic possessed guitars by Mika Lagreen (Grave) and Janne Ivarsson, the dead-rotten voKills by Roberth K. as well as the dead-rotten atmosphere created... Man, all this is death metal at its pure best, simply outstanding! The recordings and production this time took place at Slowly Rotting Studios (Guitars, Bass), Panic Room Studios (Drums) and Crypt Of Death Studios (Vocals, Lead Guitars) and it was mixed and mastered by Plec at Panic Room Studios (e.g. Scar Symmetry, Torchbearer, Watain, Warrior Soul), must say it couldn't get better than it is, how rotten and slaying can you get? The cover artwork this time has been done by Björn Gooßes of Killustrations (Gloria Morti, Six Feet Under, Sodom, Aborted, Zyklon, Amon Amarth, Norther). In fact a damn well fitting rotten Zombified art for this Swedish killing machine, it seems splattered out of an old school undead movie!! It's a hard task to pick up favourite tracks on such top quality dynamic release, yet I'll try to describe it for you! With a slower death n' roll groove, tracks like the opening "Meat Freak" or "Zombie Flesh Cult", "Mutilador" and "Swarm of Zombies" bring Facebreaker with a refreshing morbid dynamism. Yet the traditional band sound remains in hymns for the dead like the addicting title track "Dedicated to the flesh" that is an anthem to Facebreaker's 14 years of sick and twisted living-dead music, quickly followed by the hell-spawned fast track "Catacomb". With the "Nuclear Outbreak" all Hell breaks loose on another frenetic killing track, better to grab your axes and start chopping some heads while listening to these one! Bow down for the "Hellmaster", one of these albums best tracks with such an addicting virulent grove and undead rotting sound reminding of Obituary classics summoned from the grave! No time to breathe anymore, infected Zombies hunger for your human meat, "Carving for Brains" is another true death metal graveyard classic and another top track on this release! "Legions of Doom" ( Bonus Track ) and "World Cremation" are two more viciously demented fast and heavy tracks that shall be stuck to your tortured ears for a good pack of time! The album ends up with "Tomb of the hungry dead", an epic ending anthem for this Zombie holocaust! In all "Dedicated to the Flesh" is an absolutely addicting and killing album for all old-school death metal addicts, here and then with the addition of some good refreshing Death n' Roll groove into! The created sick n' twisted rotten sound is a true trademark of the band. 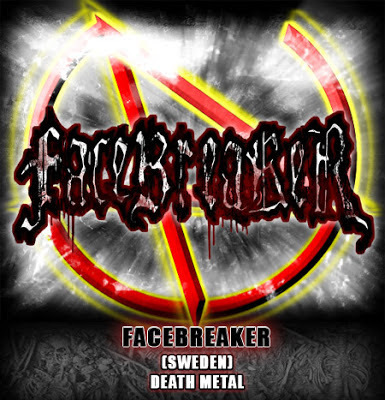 Facebreaker sound shall tear your flesh from bone and feed you to the famine zombies who shall feast with your entrails and carve for your brains! Horror death metal at its best, a killer death-cult album for adepts. One of the best hell-spawn art of death metal for 2013 and one of the most rotten pieces to come out from Swedish death metal crypts!! It Kills, Slays and can't get our of your ears! Get your hatchet sharpen, become ready for the killing or be mutilated by a swarm of Zombies. They hunger for your tender human life... they are dedicated to the flesh!